FIIB Business Review is a management focused, inter-disciplinary, peer-reviewed journal from the Fortune Institute of International Business (FIIB) New Delhi. FBR seeks to build a knowledge network of management academicians, policy makers and practitioners by establishing a dialogue through mixed publication basket that provide insightful perspectives on emerging managerial themes, management research of value to professional managers and academics, and management cases on contemporary managerial issues. Our aim is to: (1) Promote applied research in emergent themes that improve the practice of management; and (2) Serve as a vehicle of communication, between those who study management and those who practice it, by publishing articles that are both research-based and practice-based. FBR is published quarterly in March, June, September and December, and in every issue, FBR features the following sections: Research Section (conceptual and empirical research by scholars), Perspective Section (Viewpoint on contemporary and emerging aspects in the management field), Business Case Section (case on a specific problem or solution or story of business success or failure), and Review Section (review of any book, conference review, website review, review on a journal in management themes). Key benefits: By drawing on important research, perspective, case study and case review material from contributors all over the world, the journal offers genuinely international perspectives on the key issues and concerns of business practices. The journal fast track submissions and provide first round of review prior or within 60 days of submission. FIIB Business Review (FBR) is a management focused, inter-disciplinary, peer-reviewed journal from the Fortune Institute of International Business (FIIB) New Delhi, India. FBR seeks to build a knowledge network of management academicians, policy makers and practitioners by establishing a dialogue through mixed publication basket that provide insightful perspectives on emerging managerial themes, management research of value to professional managers and academics, and management cases on contemporary business issues. FIIB Business Review aims is to: (1) Promote applied research in emergent themes that improve the practice of management; and (2) Serve as a vehicle of communication, between those who study management and those who practice it, by publishing articles that are both research-based and practice-based. FBR is published quarterly, March, June, September and December and in every issue, FBR features the following sections: Research Section (conceptual and empirical research by scholars), Perspective Section (Viewpoint on contemporary and emerging aspects in the management field), Business Case Section (case on a specific problem or solution or story of business success or failure), and Review Section (review of any book, conference review, website review, review on a journal in management themes). Parth Patel Newcastle University Business School, Newcastle University, UK. Please read the guidelines below then visit the Journal’s submission site https://peerreview.sagepub.com/fib to upload your manuscript. Please note that manuscripts not conforming to these guidelines may be returned. Follow the on-screen instructions, providing the required details before proceeding further. Finish the registration and proceed as author. FIIB Business Review applies mandatory similarity check as first step of screening. Only manuscripts of sufficient quality that meet the aims and scope of FIIB Business Review are processed to further steps. If the submission meets aims and scope, formatting style and quality assessed by the editor submission is processed further to review process. A blind review process of minimum two experts from the domain is a mandatory process for all the research submissions. Authors are requested to nominate an area expert as reviewer. The submission can undergo multiple revisions, rejection or acceptance as an outcome. Editor have right to take the final decision to accept or reject the submission. Only manuscripts of sufficient quality that meet the aims and scope of FIIB Business Review will be reviewed. Before submitting your manuscript to FIIB Business Review, please ensure you have read the Aims & Scope. FIIB Business Review aims is to: (1) Promote applied research in emergent themes that improve the practice of management; and (2) Serve as a vehicle of communication, between those who study management and those who practice it, by publishing articles that are both research-based and practice-based. Format of the Submission: Submissions should be provided in Microsoft Word format. LaTex files can be used if the accompanying PDF document is provided. PDF as sole file type is not accepted, the PDF file must be accompanied by the source file. Research: The research paper must be based on original empirical research, conceptual, literature review and experiment on emerging trends globally. It can be based on either primary or secondary research. The word range should be between 6000-8000 words including tables and figures. Case: Case study and analysis of issues, companies, departments and special initiatives taken by academicians and practitioners. The word range should be between 3000-5000 words. Book Review: Reviews of recently published books on themes related to business and management. The word range should be between 1000-1500 words. Website Review: Review of websites in the pertinent area. The word range should be between 1000-1500 words. Conference Review: Review of a conference in a relevant field. The word range should be between 1000-1500 words. Author(s) are responsible for any copyright violation, and should ensure the originality of the manuscript submitted by them. Manuscript in MS Word format should be submitted via the peer-review and submission platform https://peerreview.sagepub.com/fib. FIIB Business Review requires all authors to acknowledge their funding in a consistent fashion under a separate heading. Please visit the Funding Acknowledgements page on the SAGE Journal Author Gateway to confirm the format of the acknowledgment text in the event of funding, or state that: This research received no specific grant from any funding agency in the public, commercial, or not-for-profit sectors. FIIB Business Review and SAGE take issues of copyright infringement, plagiarism or other breaches of best practice in publication very seriously. We seek to protect the rights of our authors and we always investigate claims of plagiarism or misuse of published articles. Equally, we seek to protect the reputation of the journal against malpractice. Submitted articles may be checked with duplication-checking software. Where an article, for example, is found to have plagiarised other work or included third-party copyright material without permission or with insufficient acknowledgement, or where the authorship of the article is contested, we reserve the right to take action including, but not limited to: publishing an erratum or corrigendum (correction); retracting the article; taking up the matter with the head of department or dean of the author's institution and/or relevant academic bodies or societies; or taking appropriate legal action. FIIB Business Review offers optional open access publishing via the SAGE Choice programme. For more information please visit the SAGE Choice website. For information on funding body compliance, and depositing your article in repositories, please visit SAGE Publishing Policies on our Journal Author Gateway. FIIB Business Review prefers a single paragraph abstract that includes, purpose of the context being discussed in the manuscript, method incorporated to conduct the study, and major findings of the study. 4 – 6 keywords should be given at the end of abstract. FIIB Business Review adheres to the APA reference style. View the APA guidelines to ensure your manuscript conforms to this reference style. List by their last names and initials. Use the ampersand (&) instead of "and." List by last names and initials; commas separate author names, while the last author name is preceded again by ampersand (&). Author, A. A., Author, B. B., & Author, C. C. (Year). Title of article. Title of Periodical, volume number ( issue number), pages. Biswas, S., & Bhatnagar, J. (2013). Mediator analysis of employee engagement: role of perceived organizational support, PO fit, organizational commitment and job satisfaction. Vikalpa, 38(1), 27-40. References should be arranged in alphabetical order using APA 6th edition guidelines (Please see http://www.apastyle.org for details). Any images used should be in high resolution. FIIB Business Review follows British Style of English language, i.e. colour instead of color; organization instead of organization, etc Authors seeking assistance with English language editing, translation, or figure and manuscript formatting to fit the journal’s specifications should consider using SAGE Language Services. 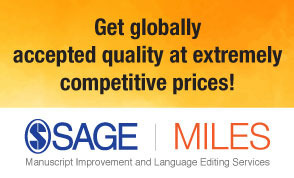 Visit SAGE Language Services on our Journal Author Gateway for further information. FIIB Business Review is hosted on SAGE Track, a web based online submission and peer review system powered by ScholarOne™ Manuscripts. Visit https://peerreview.sagepub.com/fib to login and submit your article online. Abstract: All articles must be accompanied by an abstract of 150–200 words in one paragraph format followed by 4–6 keywords. Online First allows final articles (completed and approved articles awaiting assignment to a future issue) to be published online prior to their inclusion in a journal issue, which significantly reduces the lead time between submission and publication. Visit the SAGE Journals help more details, including how to cite Online First articles.